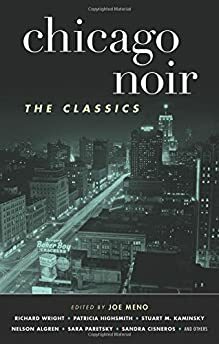 Largehearted Boy: Book Notes - Joe Meno "Chicago Noir: The Classics"
Book Notes - Joe Meno "Chicago Noir: The Classics"
Chicago Noir: The Classics is yet another impressive anthology from Akashic books, edited by Joe Meno. "Richard Wright, Nelson Algren, and Sandra Cisneros are not crime-fiction writers, and yet their Chicago certainly embodies the individual-crushing ethos endemic to noir. Meno also includes stories from writers who could easily have been overlooked (Percy Spurlark Parker, Hugh Holton) to ensure that diverse voices, and neighborhoods, are represented. Add in smart and essential choices from Fredric Brown, Sara Paretsky, and Stuart Kaminsky, and you have not an anthology not for crime-fiction purists, perhaps, but a thought-provoking document all the same." Noir is the language of shadows, of the world in between. First coined by French academics to describe the gusty, urban black and white crime films produced by Hollywood in the 1940's and 50's, it's since been applied to both music and literature. Raymond Chandler, Dashiell Hammett, and James M. Cain penned gritty sagas about the shadowy underworld of American life, depicting a sense of uncertainty, desperation, and alienation. Jazz composers and musicians of that era seemed to take notice; beginning in the late '30s a gradual shift began to develop away from the harmless big band dance standards of the prewar years to songs that were increasingly melancholy, describing in music a similar sense of mystery and emotional ambiguity. The birth of bebop seems to bear this out; nervy, erratic, nearly impossible to dance to, compositions by Charlie Parker, Dizzy Gillespie, Bud Powell, and Thelonious Monk remain as explosive and elusive as any other art from that era. A cultural shift was afoot; leaving behind the false optimism of a fictional America defined in mass-produced films, music, and books, giving way to a literature and music that presented the unfamiliar, the lurid, the uncertain, a world of shadows—of people and places reckoning with the darkness and the light—which still exists in American today. Artie Shaw, "Nightmare." In 1938, the same year Shaw's recording of Cole Porter's "Begin the Beguine" launched him from obscurity to fame, he also composed this minor-laden melody, his clarinet screeching high like a police siren at first, then becoming languorous and cool, like a criminal on the run, trying to keep his wits, dodging police, searching for a way out. Like Raymond Chandler and Dashiell Hammett, Shaw's tone and vision led the way for other musicians and composers to explore darker, more complex themes and pointed toward the moral uncertainty of the post-war years. Few other big bands before or after attempted anything like "Nightmare." Charlie Parker, "Laura." One of Bird's best-known tracks. Here he is able to transform the relatively tame theme from the 1945 film starring Gene Tierney into something immutable, unforgettable, full of a kind of longing that transcends the confines of the noir genre. Aided by orchestra strings, his alto gathers and soars, presenting a haunting, conflict perspective on the trappings of love. Miles Davis, Ascenseur Pour L'Echafaud, film score. Davis improvised much of his trumpet playing on this 1958 French crime film. There's a lovely, distant quality to the way he uses the mute throughout, which make the events of the film seem faraway, mythical, and fantastic. That distance, that sense of moral ambiguity perfectly matches the tone of the film. Stan Getz, "These Foolish Things." For someone so restrained, so subdued as to help invent bossanova, there's something amazingly urgent and overtly sexual about the playing on this downbeat ballad. It always reminds me of two lovers on the run, enjoying the last few hours of pleasure before the law comes down. The sax rides over a solitary xylophone and by the end, becomes a kind of insistent plea, delving into the all-out abandon of what one day would be called rock n' roll. Sam Butera, "The Boulevard of Broken Dreams/Fever." Louis Prima's sideman Butera presents a crime story entirely through music, his sax taking the listener on a tour of dive bars, abandoned jewelry stores, and riverside cliffs. The song crescendos with Butera's restless sax and then slips into "Fever," an entirely stripped-down version, heavy on bass and piano. Butera's voice is non-nonsense, accentuated by handclaps, and a male chorus, driving toward another Butera sax solo, though this one is more desperate, unconstrained, sporadic. There's something about the shift from an instrumental to a vocal popular tune that feels uniquely cinematic, like a long tracking shot establishing the larger world, then giving over to the specific, intimacy of two desperate characters. Johnny Mandel, I Want to Live! film score. Best jazz film score ever. Gerry Mulligan's take on Mandel's themes are a classic in their own right. These songs capture the fear and hopped-up electricity of Hollywood's vision of youth and criminality, basically positing that jazz and booze will always lead to murder. Ken Vandermark, "Encino." This is the soundtrack to a film that does not exist, or not yet anyway; it's impossible to sit and listen to this long-playing number and not be inspired to conceive all manner of dastardly plots; the rhythmic lines are long and constant, the reeds subtle, an irresistible and gradual seduction, like the proposal from a former starlet to please murder her millionaire movie producer husband.